Arashiyama is a touristy district in the western outskirts of Kyoto. It also refers to the mountain on the Oi River which forms a backdrop to the district. 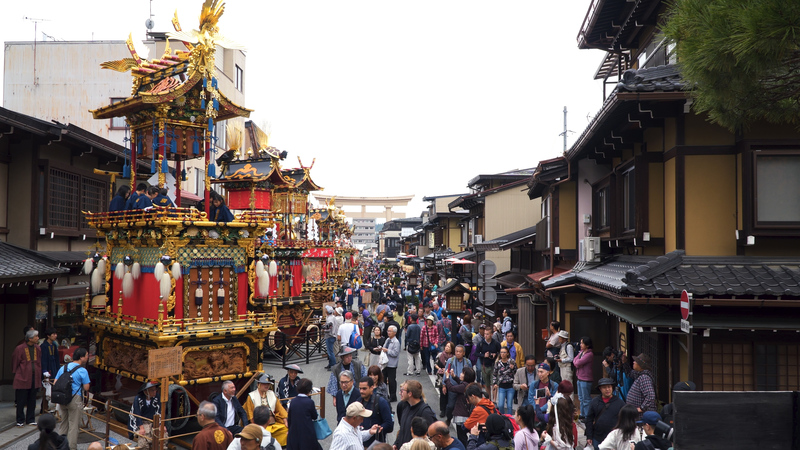 Since the nobles in the Heian period (794-1185) started building their villas in the Arashiyama district, this area has been a very popular destination for Japanese tourists, especially in spring for the cherry blossoms and in the autumn for the fall colors. During these seasons, many people visit Arashiyama to appreciate the spectacular scenery. Togetsukyo is a 155-meter-long bridge that spans the Katsura River. 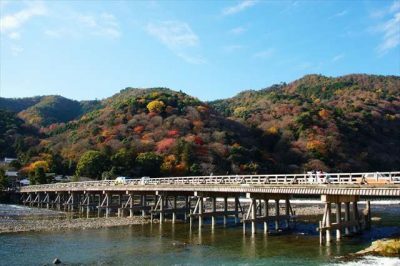 The name Togetsukyo means “Moon Crossing Bridge” in Japanese, which derives from Emperor Kameyama and his 13th-century poem. 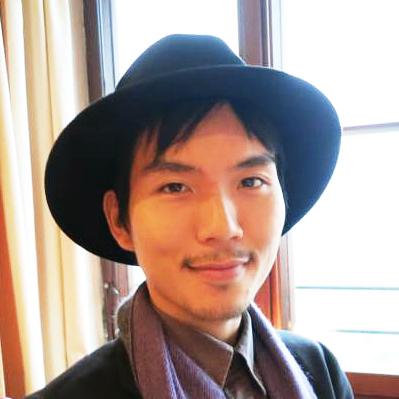 He described the bridge in one of his poems, “as if the clear moon is crossing the bridge.” Ever since, the Togetsukyo Bridge has been an icon of Arashiyama. 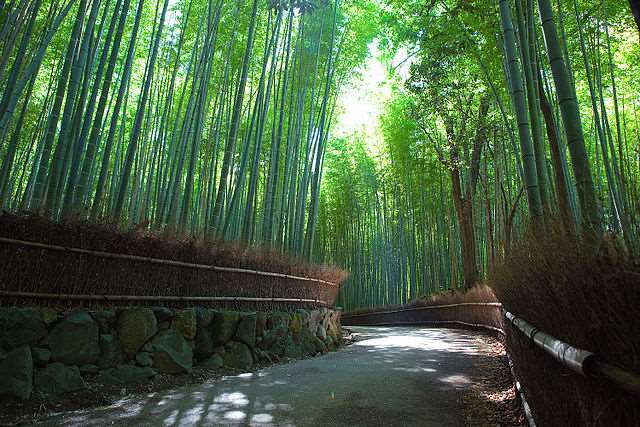 Another symbol of Arashiyama is the bamboo forest. It is intersected by a 700-meter path that starts from the north of Tenryuji temple, passes through the Nonomiya shrine, and ends near Okochi-Sanso villa. The vigorous bamboos growing towards the sky rustle in the breeze. After walking this path for just a few minutes, you will already feel calm and relaxed. 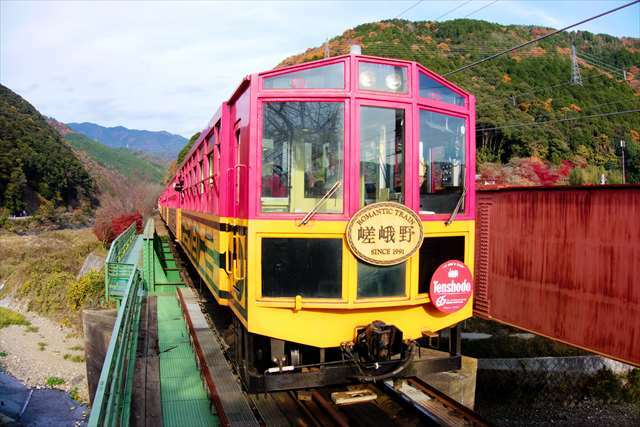 The Sagano Romantic Train is a train that runs along a scenic route between Torokko-Saga Station and Torokko-Kameoka station. 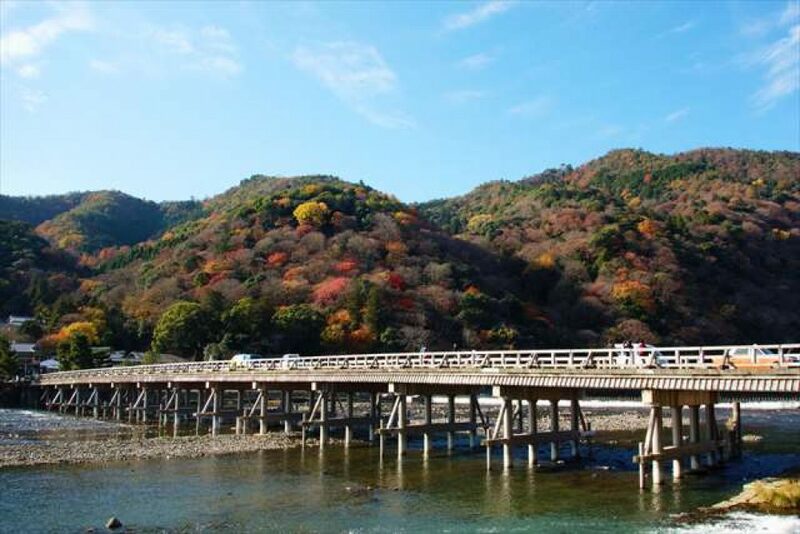 On this 25-minute train ride, you can enjoy the magnificent sights of Arashiyama. The ride shows different scenery during each season: cherry blossoms in spring, tender green in summer, red leaves in autumn, and occasional snow flake in winter. Among them, spring and autumn are two most popular seasons, when tickets are likely to be sold out a month before the departure date. After taking the Sagano Romantic Train to the Torokko-Kameoka station, a great way to come back is by riverboat. 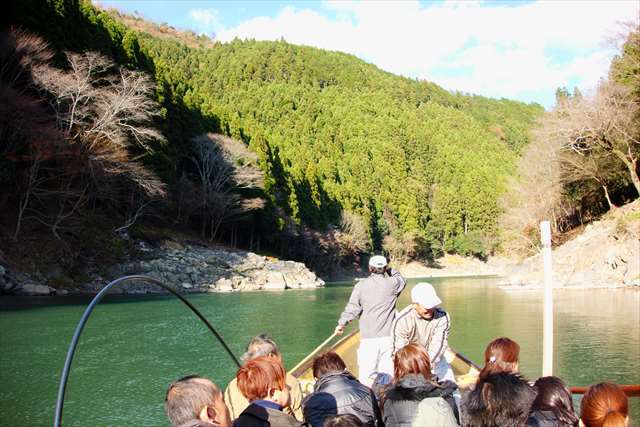 The Hozugawa River Cruise is a 2-hours, 16-kilometer journey with seasonal scenery and thrilling rapids. Boatmen pilot a boat with bamboo poles and guide the way through the deep ravine. To be honest, this cruise may not suit everybody, as it costs 4,200 yen (about 40 dollars) per person, and the boatmen speak only in Japanese. But the natural scenery of the largely undeveloped ravine is at least worth seeing. When you get templed out in Kyoto city, Arashiyama can be a great getaway. 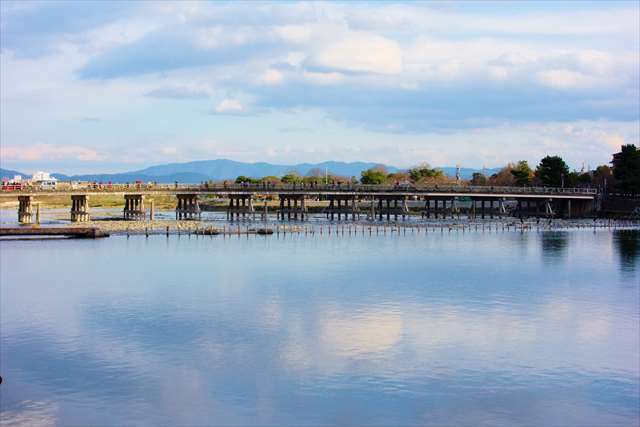 Surrounded by the natural scenery of Arashiyama, you can feel as easy and relaxed as it gets. If nature does not do it for you, there are even Onsen (hot springs) in the area, ready to spoil you. Of course, after you recharge your battery again, there are so many great temples in the Arashiyama district awaiting you as well.